Mark Yates, the new Harriers manager, arrived with a bang last Friday and that explosive arrival continued on Saturday when he took his new charges to Woking and got us the long awaited away win that had been over three months coming. Johnny Mullins got the only goal of the game and this week the club announced that he was now here for the remainder of the season - meaning that he'll be here until his contract with Reading runs out and we will be in with the best chance of first dibs on him. Yatesy also said that so far we have received no offers from any other club for the three players rumoured to be on their way out of Aggborough. Mark Jackson has been linked with York City, Iyseden Christie with Lincoln City and Wayne Hatswell is interesting Rushden & Diamonds though for what earthly reason would he want to go there for with them heading back to the Conference at a rate of knots. 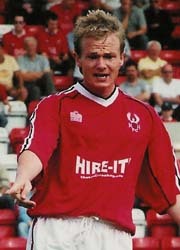 One of our ex players, Dean Keates, has this week handed in his notice at Lincoln so there could well be a player swap involving Christie if he doesn't sign for Walsall as rumoured. Missing for the game against Grays tomorrow will be Daryl Burgess. He has now racked up five yellows after having one struck off when he was sent off at Burton and, at a stretch, could find his place being taken by Mark Yates' right hand man Neil Howarth. This will only happen if other players are not available and at the time of writing we don't seem to have any other injury problems. One player not available will be Gavin Hurren following his month long loan to Bromsgrove Rovers this week. Again for the umpteenth week running I can find no real information from the opposing clubs websites. Grays are no exception to this and I was told today that they never put team news on the website. To my mind this is a shameful way to treat fans of your own team let alone the opposition. Grays, with ambitions of joining the Football League, have what is certainly the poorest Official website in the Conference and have taken over the mantle once held proudly by Southport. If they wish to be taken seriously as a big club with ambition and potential then they're doing themselves no favours in that area. So far all I have come up with is that Jamie Stuart is suspended and they might have a couple of new faces in the side by Saturday. Darren Blewitt, who played for Hereford against us last year, is about to join Grays on loan from West Ham and defender Christian Hanson may be joining permanently from Leyton Orient. Although this isn't a League game and will have no bearing on our fight to climb the table it's still an important game for us because a win in this will raise the confidence levels of both the team and the fans. We accept now that we have no real chance of making the play-offs but we do have decent chance of progressing further in this trophy. Grays are going through something of a bad spell in recent weeks and will also be hoping to get back on track but I'm sure they'll shed no tears if they lose this one. Danby, Lewis, Hatswell, Flynn, Mullins, Ludlow, Jackson, O'Connor, Fleming, McHale, Graves, Heslop, Russell, Penn, Christie, Pugh, Hollis, Sheldon, Wilson, Butler, Blackwood, Thompson. Bayes, Eyre, Sambrook, Mawer, Bruce, Nutter, Matthews, Angus, Olayinka, Hooper, Poole, Martin, Kightly, Thurgood, Williamson, McLean, Oli, Slabber, Battersby.